Imagine being seven months pregnant and living on the street in San Francisco. Or in a housing project where noise and crime make it impossible to sleep. Or in a home with an abusive partner. Many low-income African American mothers in San Francisco are impacted by these harsh realities — which means their unborn children can be too. A recent assessment led by San Francisco State University’s Health Equity Institute (HEI) found that stress from racism and poverty is affecting the health of pregnant African American women in unstable housing situations and contributing to pre-term births. The assessment builds on reports by the San Francisco Department of Public Health that found that the city’s African American women were 2.7 times more likely to have a preterm birth than white women and that half of the residents of public housing in San Francisco are African American. “In San Francisco, preterm birth rates are highest for women who are homeless and who live in single-room occupancy hotels and public housing,” said Jessica Wolin, health education lecturer and HEI’s associate director of community practice. Wolin has researched public housing issues for the past six years. In 2017, she was asked by the University of California, San Francisco (UCSF) Preterm Birth Initiative to lead a community assessment probing the connection between housing vulnerability and preterm birth in the city. 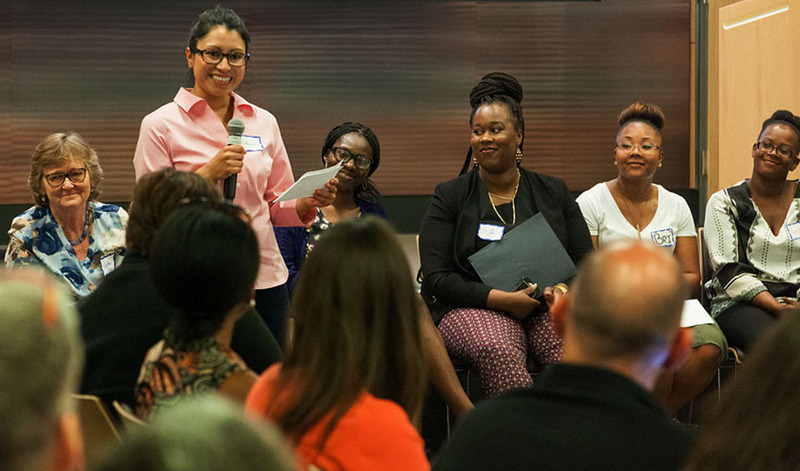 Wolin, HEI staff and SF State master of public health students partnered with UCSF, women from the community, local nonprofits and the city’s Department of Public Health. The assessment revealed that pregnant women without adequate housing are often unable to access emergency shelters until their eighth month of pregnancy and have no priority access to public housing. “If you are trying to prevent preterm birth, these policies are shortsighted and undermine the health of women and babies,” Wolin said. SF State staff and students created a curriculum on community-based research principles for use by the community representatives and interviewed staff from housing- and health-related programs. They helped facilitate focus groups with 84 women who had been pregnant and experienced housing insecurity in San Francisco. The women detailed the related stress they had experienced that contributed to the loss or premature birth of their babies. The assessment recommends improved city policies, such as designating units for pregnant women as part of new housing developments, creating shelter spaces specifically for them and conducting stress and mental health screenings during all pre- and post-natal care appointments. “The team led the research and developed the evidence for the nonprofits to go forward with the advocacy work,” said Wolin. HEI staff also supported the women from the community in presenting the assessment at academic conferences, press conferences and a UCSF event that coincided with World Prematurity Day. According to Sarah Wongking, a former HEI staff member who helped lead the assessment and is now a lecturer at SF State, this project epitomizes what makes SF State so unique. Funding for the assessment was provided by the UCSF Preterm Birth Initiative with a gift from Marc and Lynne Benioff.